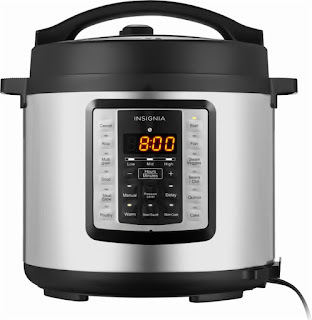 Today only, while supplies last, Best Buy is offering this Insignia 6-Quart Multi-Function Pressure Cooker for just $39.99 shipped (Retail $99.99). This highly rated pressure cooker has 14 preset options so that cooking is as easy as pushing a button. The 6-quart capacity is large enough to cook for a family and the bowl is dishwasher safe making clean up easy!